Recipe torn out of the pages of Better Homes and Garden. Scanned. I love your honey jar. I just bought chalkboard paint to paint all my glass jars as well! And, as always, this is lovely. I love gazing at your photos. beautiful photos. these look amazing! I used black pepper in a gingerbread cookie for the holidays and it was great :) it really brought the spice to a next level. Gosh, I love how perfectly square the pieces of cake are. Looks lovely and delicious! Beautiful pictures, as usual! Triple ginger is a fail-proof way to make me happy - these look wonderful! Oh these look fabulous! Triple ginger, sounds amazing, and your photos are just absolutely gorgeous. These are stunning,and so are your photos. I actually prefer cake in little squares like this, I feel so much more virtuous eating them! Your photos are better than the magazine's! I'm intrigued by the idea of black pepper in a cake, but I guess if the fieriness of ginger works, why not. 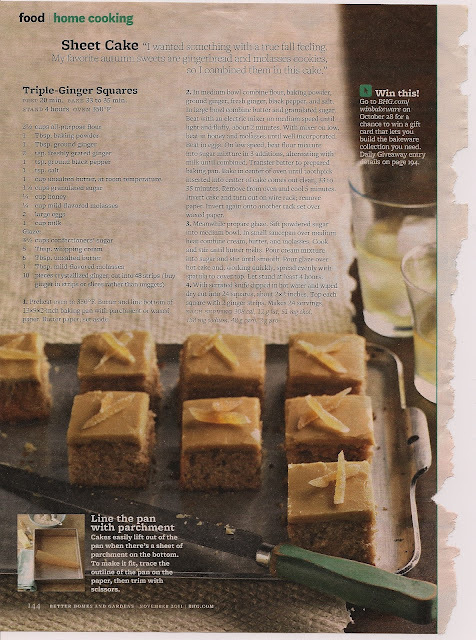 Your photos are simply stunning as always - even the torn out recipe page looks pretty! Hi there! I recently got a bottle of chalkboard spray paint and I'm looking forward to playing around with it. Is that what's on the honey bottle? I'd love to know! Very cool. As always, these photos are stunning--especially the bars on the cooling rack. I love that you scanned the original recipe! Oh man, we LOVE ginger at my house. I'll have to try this! hummm - poetic gastronomy ! Mmmmm!!!! And a lovely blogg! I bet the ginger tastes wonderful! I ripped that page too ! It is in my to-be-made folder. Glad they turned out yummy for you. I love the resurgence of the homemade sheet cake, I think the little squares look so much nicer than cupcakes, and the quantity of icing is far more palatable. Love the photos. It all looks so yummy. I just love these little squares. These are awesome! You are right about the pepper; it adds a really nice twist.